I’ll admit that I was really bad at cleaning brushes until recently (as in: I didn’t do it at all). My brushes were gross and just felt dirty every time I put them against my face. So it was time for some action! Time to become educated in the realm of brush cleansing! So during a shopping trip with some friends about 6 months ago I picked myself up a bottle of Sephora Makeup Brush Shampoo. With great anticipation I finally set out to clean my brushes, creating an entire assembly line of wash, rinse, and dry at my bathroom sink…..only to be sorely disappointed with the outcome. Although my brushes were cleaner, they were not completely clean. So I tried again, and again, each time using more shampoo…thinking that maybe I hadn’t used enough. But my brushes were never perfectly clean, and my rather small $9 bottle was withering away with very few results. I decided one day to try something new. My roommate at the time suggested a mix of dish soap and olive oil, and my research agreed (on Pinterest… not always a reliable source). So I went at it, only to have greasy oily brushes no matter how much I rinsed them out. By the end of these cleansing attempts I was frustrated and had a plan to start fresh and buy new brushes. My cleansing had gone so poorly I wanted to throw all of my brushes in the garbage. But how does one do something like that on a budget?! I can’t afford to buy a whole new brush collection!! So it was time to take matters into my own hands. Ignore all the suggestions I’m getting online and from friends. Lets just clean these brushes!! So in a total genius moment I decided to try my Neutrogena Fresh Foaming Cleanser. If I trust this cleanser to take my makeup off every night, maybe I can trust it to take makeup off my brushes. With a small pump of the cleanser in my hand, I blended the brush against my hand thoroughly then held it under warm water. I’ve never seen so much makeup come out of my brushes so fast! I didn’t even know all that makeup had been in the brush to begin with! After a few hours of drying the brush was as good as new!! No product has ever cleaned my brushes so well!!! And no money had been spent other than the $9 of the failed Sephora Makeup Brush Shampoo. So the lesson I have learned? 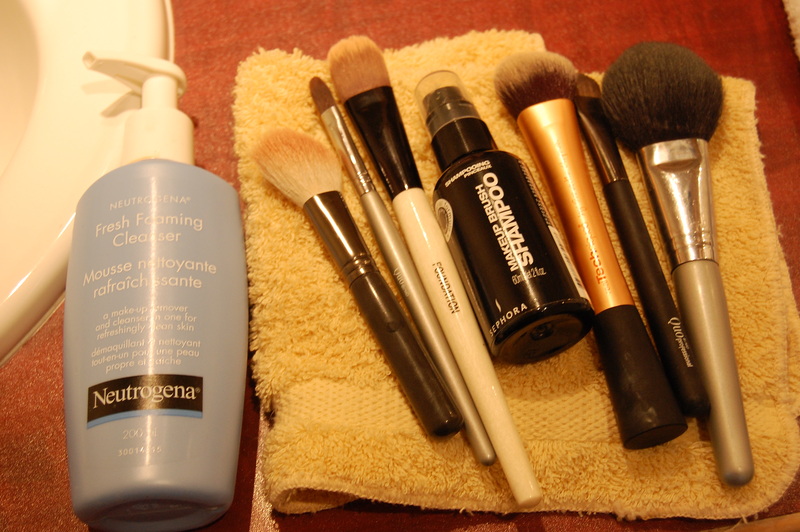 Nothing cleans makeup brushes as well as the daily facial cleanser you trust to clean makeup off your face. Many of my friends have also suggested baby shampoo, although I have never attempted it myself. If you trust it on your face, you should trust it on your brushes! So try it out! What makeup brush cleaner works for you?